The call of the male can be heard kilometres away. Hyla meridionalis is a slender, smooth-skinned frog with long, slim limbs and adhesive discs on all digits. Its forelegs are equipped with 4 fingers. The back legs are thinner and longer (to assist jumping), and end with 5 webbed toes. This frog is normally 3 to 5 cm in length. Usually the back is bright and military green, but a yellowish, grey, brown or spotted coloration may occur. 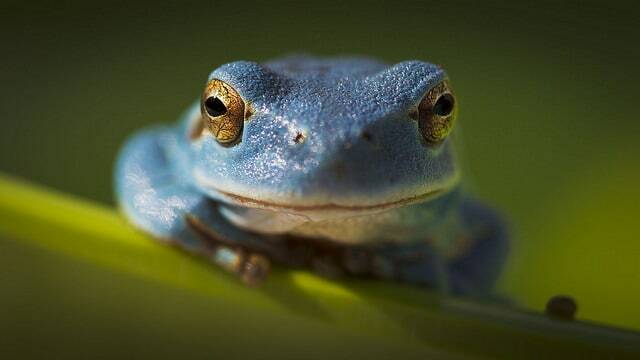 In addition, in some villages of the Iberian Peninsula it is fairly usual to see blue Mediterranean Tree Frogs. The underparts are whitish, except the legs, which tend towards yellow or pale orange tones. The abdominal area is rough in texture. Adults have a dark stripe running from the nostril, across the eye and tympanum, to the armpit. This varies from black to brown. The young can have stronger and longer markings, shrinking as they become adult. 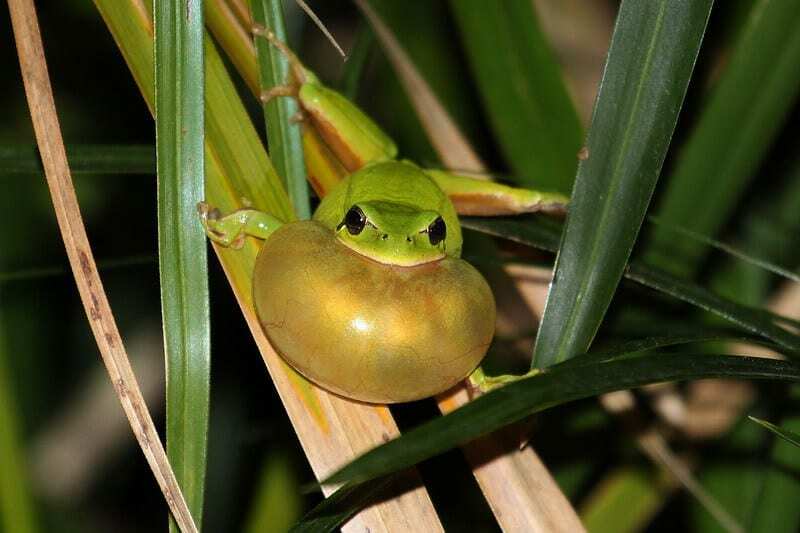 Males have a big vocal sac, dark yellow to brownish in colour, which becomes inflated when croaking and folds length-wise when resting. 10% of the sale price of this neckwarmer is donated to the environmental NGO Serbal. For further information about the work carried out by Serbal, take a look to this page. The Mediterranean Tree Frog is similar to the Common Tree Frog (Hyla arborea), distinguishable according to where the dark stripe finishes. In the case of the latter, this extends to the inguinal area and forms a loop on the back. This frog also has dark stripes on its legs. As explained above, the black stripe of the Mediterranean Tree Frog finishes at the armpit. 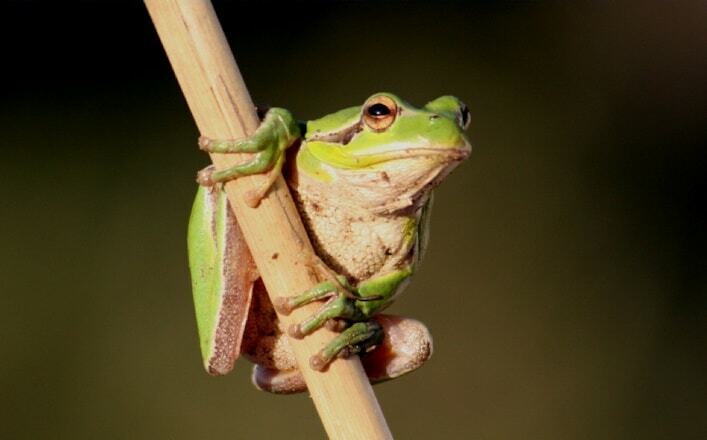 For this reason, the Mediterranean Tree Frog is sometimes known as the Stripeless Tree Frog. These two species sometimes interbreed, resulting in infertile hybrids with an intermediate colouring. 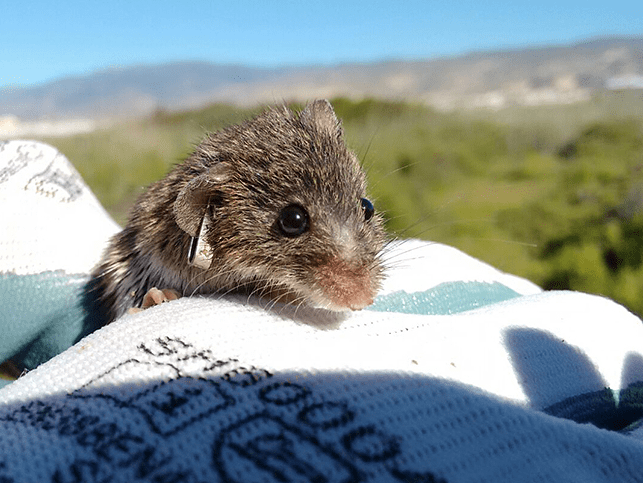 The distribution of this species is in the Mediterranean region, namely Southern France, Monaco, North-west Italy, Spain, Portugal, Gibraltar, and North Africa (Morocco, Northern Algeria, and Northern Tunisia). Hyla meridionalis has also been introduced to the Canary Islands (Spain), Menorca (Spain), and Madeira (Portugal). In the drier parts of its range, such as in parts of North Africa and the Iberian Peninsula, the distribution is more fragmented, as less suitable habitat is available. It is usually found at low to mid elevations from sea level. Exceptionally, it can exceed 1,000 m in Spain and France. Moreover, in Africa it has been recorded ataltitudes of up to 2,650 m in Oukaimedene, in the High Atlas Mountains. Hyla meridionalis prefers wetlands with abundant aquatic and riverside vegetation. It has arboreal habits, so it likes vegetation strong enough to climb. Breeding takes place in ponds, ditches, temporary pools, springs, lagoons, flooded meadows, wells, cattle pools, and even swimming pools. It occurs when the temperature raises and it rains. The timing of breeding is usually between March and April in North Africa, from April to June in France, and from December to January in Portugal. In Spain it occurs mostly in spring. However, some Spanish populations mate twice, in spring and autumn. In the evening, males go to the water and start calling by inflating their vocal sacs, usually floating in the water or perched on a plant. Beginning to call encourages other males in the vicinity to do likewise. Little by little their calls build to produce a deafening chorus that can be heard kilometres away. Females come to these calls and the amplexus (coupling characteristic of the amphibians) takes place. The male grasps the female by the armpits using his front legs. It fertilizes the eggs as they are released from the female body. The encounter can last from several hours to a few days. Each female lays an average of 300 eggs in clumps of around 10 to 30. They are placed on submerged plants or directly on the bottom of the pond. When breeding finishes, males and females disperse and return again to the nearby vegetation. The ovum has a gelatinous covering and a diameter of 3-5 mm. Tadpoles hatch after 8-15 days with a total length of 3-8 mm. They grow to 4-5 cm. 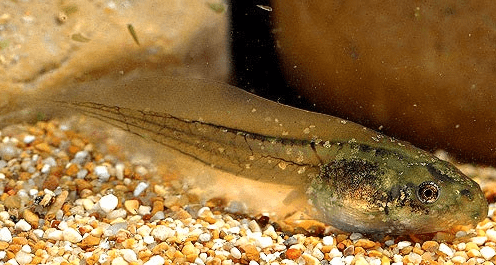 Tadpoles have a very high and characteristic dorsal fin. Metamorphosis occurs some 3-4 months after hatching. Once the tail is lost, they become small frogs of 1-2 cm. This species is especially active during the twilight hours and at night. However, they can also be detected during the day, mainly in the breeding period or on rainy days. Hibernation over the winter is possible in some areas, while in others inactivity occurs in summer (aestivation). 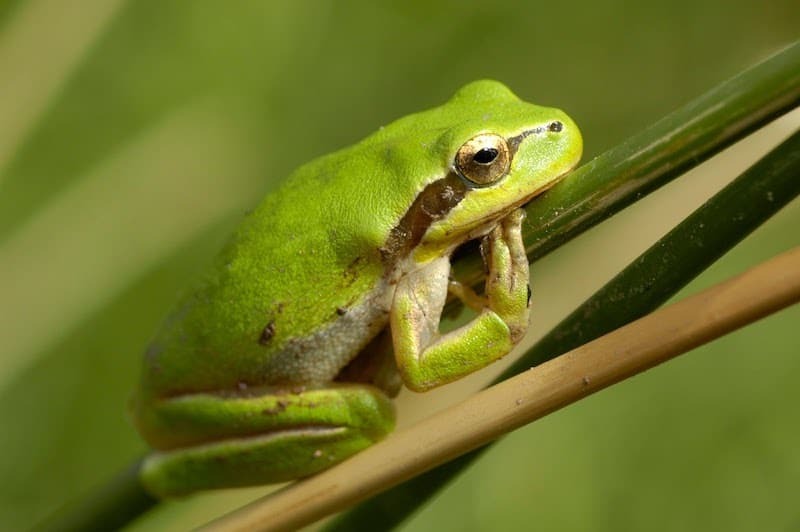 The diet of the Mediterranean Tree Frog consists of a variety of invertebrates, including beetles, butterflies, moths, flies, ants, and spiders. Principal enemies are terrestrial and aquatic snakes, aquatic birds, nocturnal raptors, and carnivorous mammals. The main defence system used is mimicry, as they are difficult to spot while resting immobile amongst the vegetation. Escape is also possible by jumping or climbing. In addition, they have the ability to give off a toxic substance through the skin. Average lifespan in the wild: 8-10 years. Hyla meridionalis is a widespread and generally common species, not currently considered at risk of extinction. However, the rapid alteration and loss of habitat could modify this in a short period of time. The population of the South-eastern Mediterranean Coast and the isolated population in the Basque Country (Spain) could be considered the most endangered. Destruction of habitat and breeding sites due to the intensification of agriculture and the development of infrastructure. Aquatic pollution as a result of the intensive use of pesticides and fertilizers, and the anti-mosquito campaign along the Mediterranean Coast. Introduction of non-native crayfish and other fish. Evaluated by the IUCN Red List of Threatened Species as Least Concern (2009). The highest density of the species can be found in the banana plantations of the Canary Islands. When a group of males call at the same time they produce a deafening chorus that can be heard kilometres away. 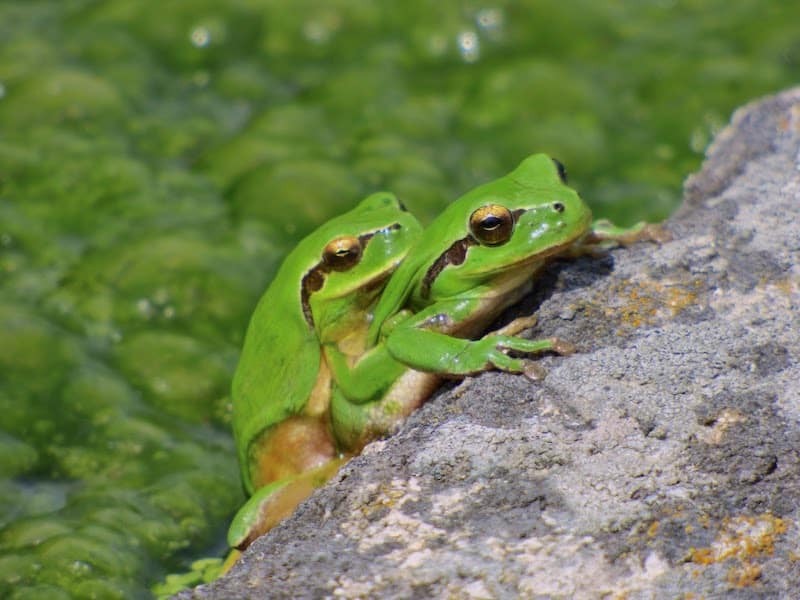 Frogs of the Hyla genus are the only amphibians present in trees in Europe.